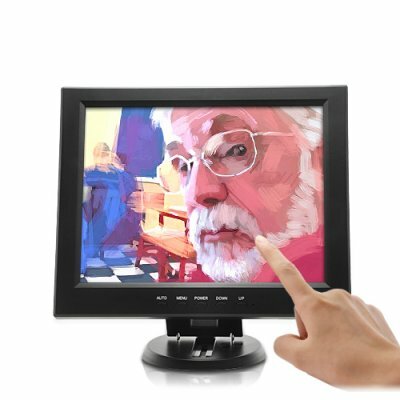 Successfully Added 12 Inch Touchscreen LCD with VGA - 800x600 to your Shopping Cart. 12 Inch LCD Touch Screen Monitor with VGA port and stylus. Following the success of our 9’, 15’ and 19’ touch screen LCD monitors, we are proud to introduce the 12’ to complete the series and offer you one more option for these amazing products. At half the price as regular monitors, but with twice the functionality, this 12 Inch Touch screen LCD is the ideal replacement for that old CRT monitor. Additionally, as an affordable all-in-one Point of Sale (POS) business solution to help increase efficiency and boost productivity at your place of business, this 12 Inch Touch screen is unbeatable! Touch the screen directly with the stylus (included) or your fingers to input data and even lay it flat to use it as a tablet. This is great for artists and graphic designers who wish to draw directly on their screen. Why waste time sketching out your ideas on paper and scanning them when you can now sketch right on the screen! Kids will love it too. Open up Microsoft Paint and let them screen finger paint! Great for hours and hours of fun! And when it comes to the serious business, this 12 inch display will make an ideal POS (Point Of Sale) business solution! POS screens aren't just transforming the food and beverage industry (bars, food court shops, coffee and donut stores, etc. ), they're revolutionizing how quickly business is done in the entire retail business realm. Whether you're in retail sales or provide consulting solutions for the industry, add this point of sales phenomenon to your arsenal to increase sales, improve the customer service experience, and minimize cash transaction losses. Click on "Add to Cart" right now to try out this amazing product for yourself. In stock, theis 12 inch touch screen monitor is available for immediate shipment and comes with a 12 month warranty. Brought to you by the leader in wholesale LCD screens, Chinavasion.